It is no secret that a good deal of us struggle with image theft in the online world. For many years the online landscape was bleak and hopeless. Image theft was rampant and the consequences rarely enforced. Reasons for this lack of order come from the sheer size and open nature of the internet. It is incredibly easy to find, download, and use any media one should please. The same is not quite true for the artists creating this media. They are left with the daunting task of trying to find each and every instance of their media being used. That in and of itself can take a good portion out of an artists busy day, and the more successful you become, the amount of copyright infringement only ramps up. Not only is the process of hunting down copyright infringement tedious, what follows is a lot of correspondence, and mediation between two parties. What compounds the problem further is that most photographers simply do not understand the licensing process and are at a loss when it comes to dealing with this by themselves. As a result, many image thieves are left free to do as they please because photographers and artists simply do not have the time or knowledge to deal with the problem. Pixsy hopes to change all that. 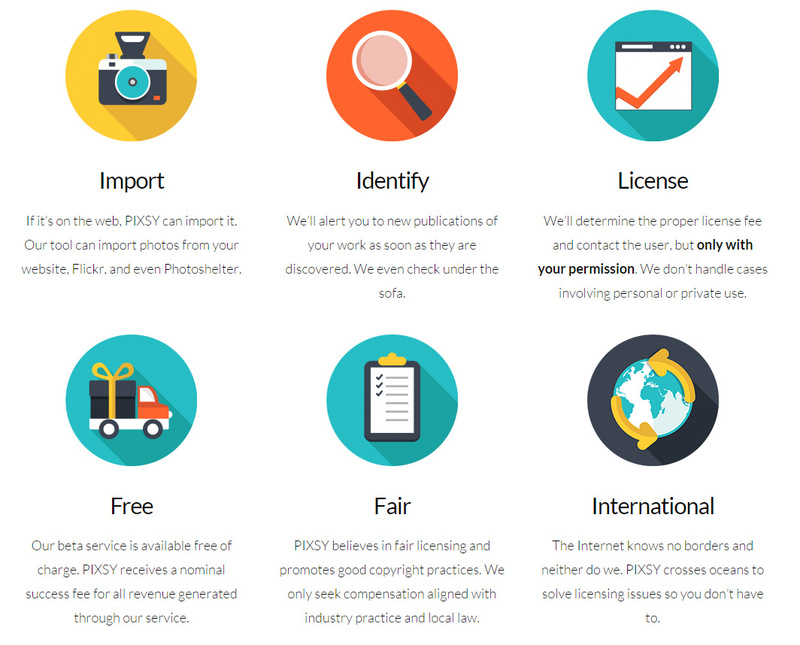 Pixsy is a new online service which hopes to liberate and simplify the entire complicated process of copyright infringement through their online software. Pixsy claims that they will be on the look out for your stolen images across the web. Once they find these images, they will take it upon themselves to alert you, and to put together a fair licensing fee based on usage. With your permission Pixsy will contact the user to settle the dispute and will continue to act as a liaison between the parties. Pixsy also aims to be completely international and will operate in a variety of languages to overcome any barriers. Once you create a Pixsy account, which is very straightforward and simple, you are able to access the front end of the website. Creating a profile with Pixsy is just like creating a profile on any other website. A few crucial pieces of information are required and they even included the option for an avatar. 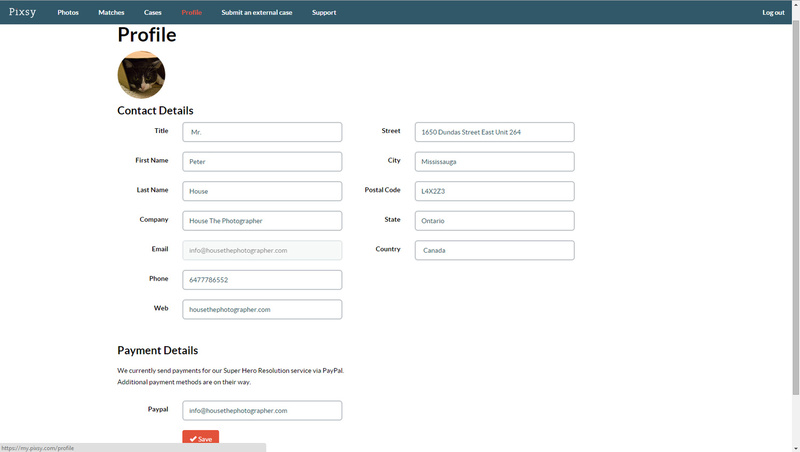 Once your profile is created, you are ready to begin using the service. The first step will be to link all your images to the service. The process is incredibly easy. 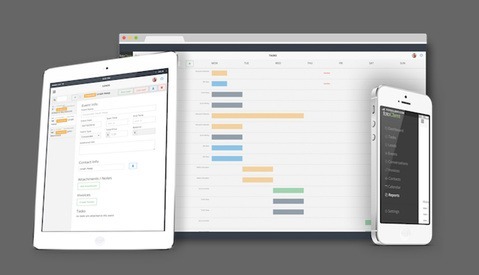 Pixsy allows you to directly sync your account with your website as well as several popular photo sharing platforms. 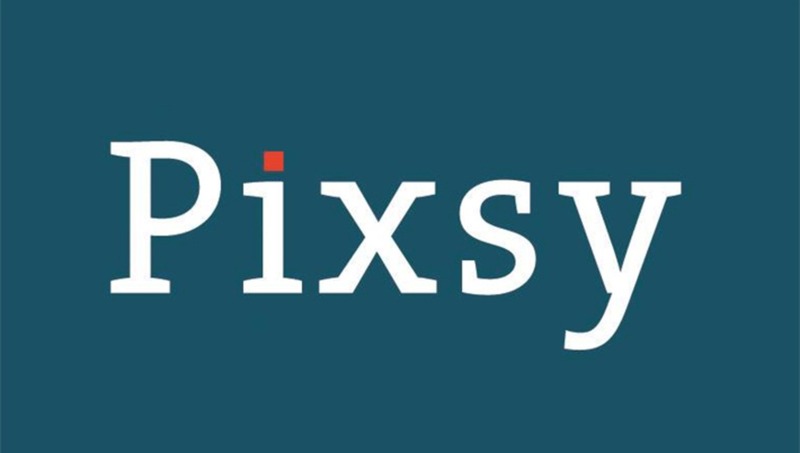 Every time you upload anything to your website or to the social platforms you have linked, you can sync your Pixsy account and it will recognize the new images and begin scouring the web for them. We don’t always share everything on social platforms or in our portfolios, and for this reason Pixsy has also included a very handy Dropbox upload option, as well as a direct PC upload. This means you can personally take charge of EXACTLY which images are being monitored. 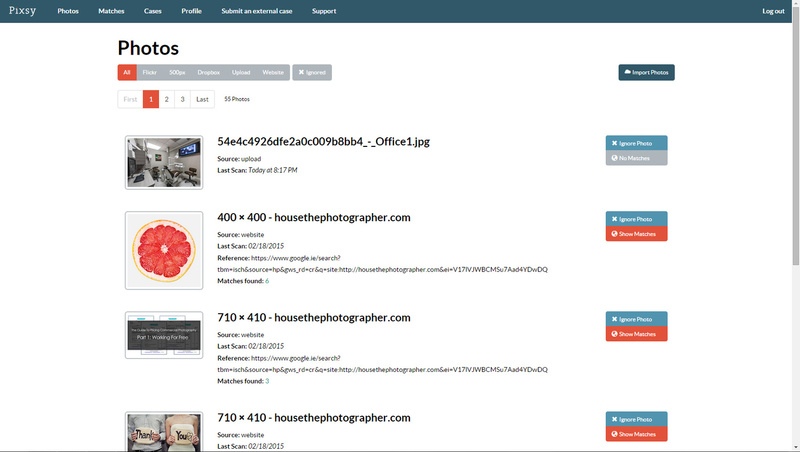 Once you have uploaded your images you can choose to view them based on the exact source of upload. 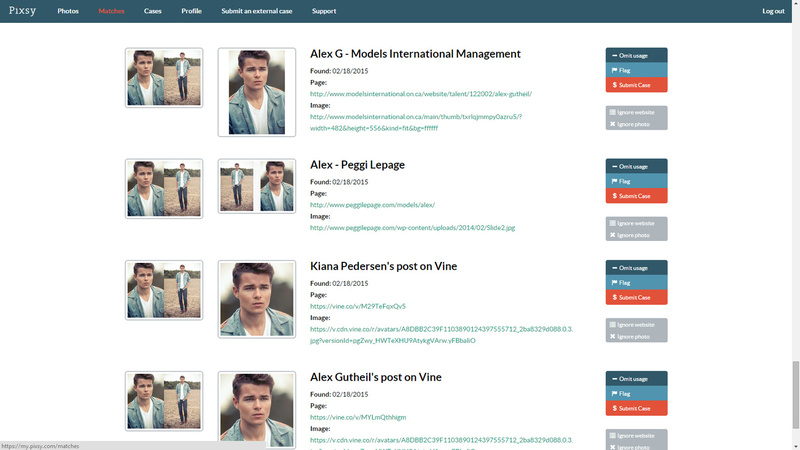 Or you can choose to view the images from all sources. As you will notice, initially, things can get a little muddy, especially when it comes to your personal website. Pixsy will report EVERY image on your site. This includes logos, avatars, and banners. Pixsy does however include a handy “ignore photo” button, which allows you to comb through the results and hand pick the images you want to monitor, and the ones you deem unimportant. Pixsy will need a bit of time to scour the web, but over the course of a few hours should there be any matches, you will begin to see them reported. 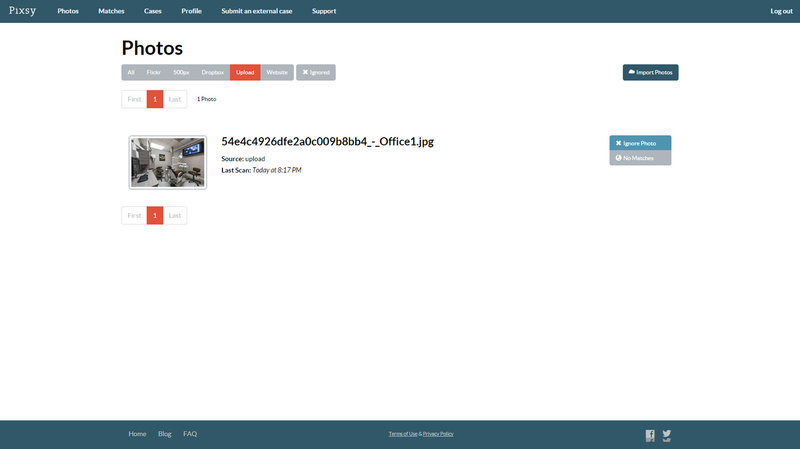 There will be an individual count of all the matches for each image along with a button marked “show matches” that allows you to review all instances of a match for that image. Once you choose to review the matches for an image you will see all the places Pixsy has found your image complete with a direct link. I was floored by how effective Pixsy was at finding images. It found my images in more places across the web than I could have ever imagined. Of course, not all of these sources will be violating your copyright, so Pixsy includes an “omit usage” button, allowing you to deem that instance OK, and Pixsy won’t report it to you. Although, they will still file it in a separate folder called “ignored images”, should you make an error or need to review something in the future. 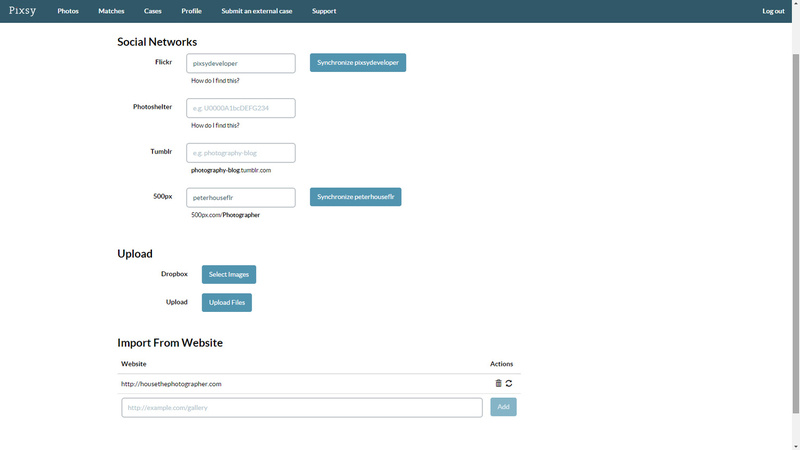 Pixsy also gives you the option to omit entire website and you can create a list of “trusted” sites which have permission to use your images and will not be reported to you. 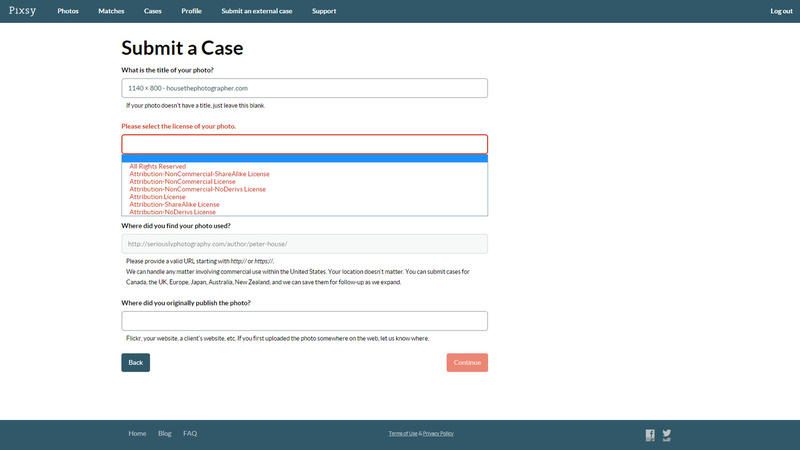 If you should deem an image to be in violation of your copyright, you can simply click the “submit case” button beside the appropriate image, and proceed with filing the case through the Pixsy service. Pixsy will ask you for a few pieces of information so that they can proceed with the paperwork, and once you provide that, they will take care of the rest! I absolutely LOVE the fact that there are so many quick and easy ways to sync with the service. 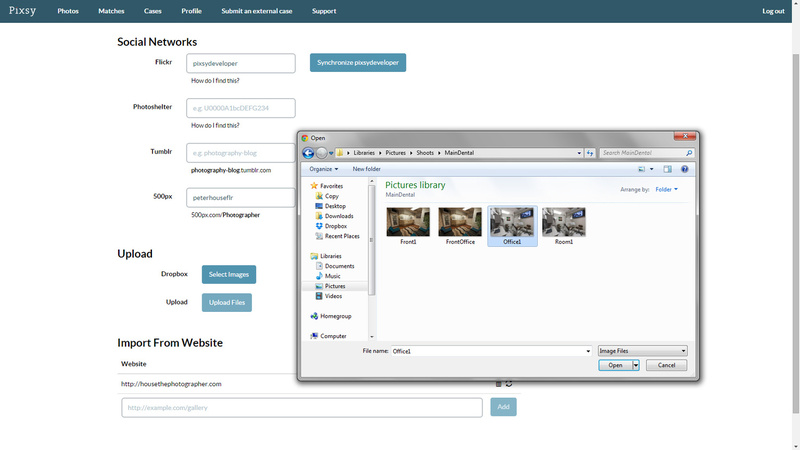 I can directly sync my site, my 500px account, and my Flickr. I can upload personal images directly from the computer and I can upload entire folders from the cloud. It could not be easier to show Pixsy my images. Uploading once is easy, but updating is even easier. Beside each source is a "sync" button that you can press to make sure Pixsy is seeing the most current versions of your online portfolios. I was blown away by the powerful search algorithm. I have done reverse image searches before and I feel like this gives a deeper scan. It turned up my images from various places I had never found before. I love that you can make a list of "trusted" sites that have permission to use your images. For example, when I write for Fstoppers I will often upload images of mine within the articles. 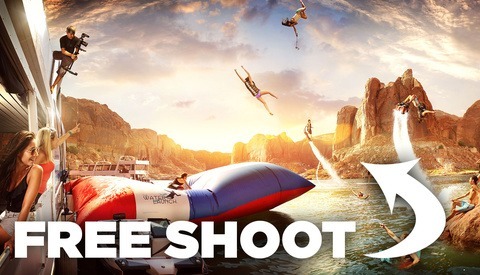 I don't need Pixsy to keep telling me that Fstoppers is using my images. So I can simply set Fstoppers as a "trusted" source, and omit any results from them. At the heart of it, this really is the matter of discussion, and Pixsy handles it remarkably well. 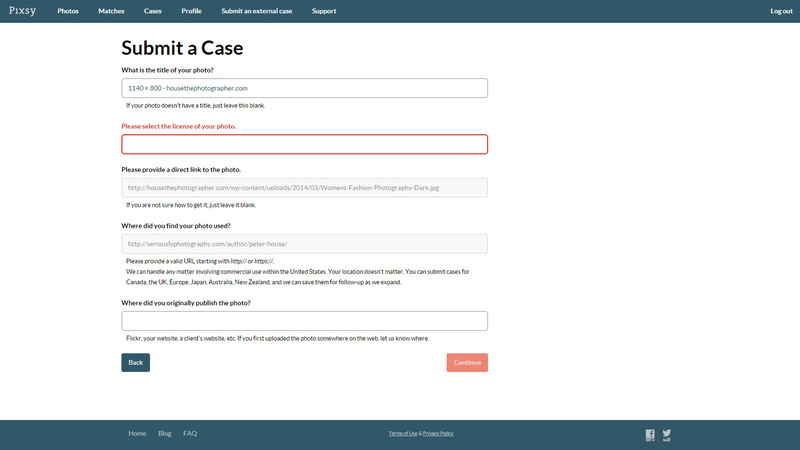 Each image has its own "submit case" button so you don't need to figure out how to deal with each image separately. 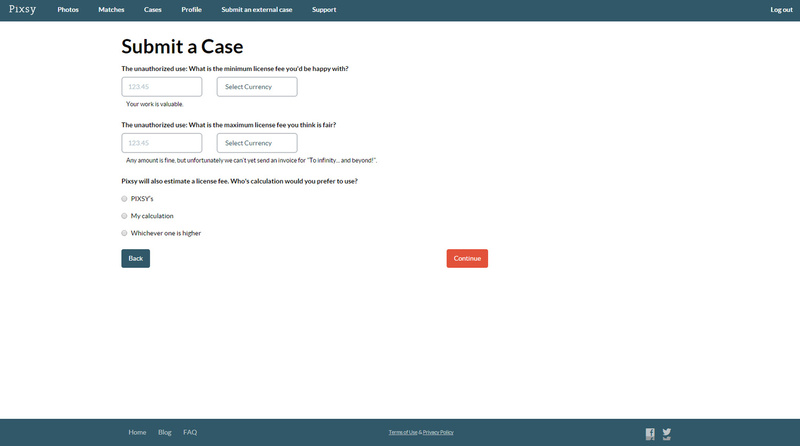 Filing a case means answering a few questions, most of which are quite easy to understand. I wish there was a notification feature included that would give you a quick visual count of all new matches from the landing page. I personally found it a bit cumbersome going into the matches page and having to remember whether or not there are any new matches since my last visit. I find the lack of this feature makes checking the site feel like a chore, and as a result, I don't check it often. Even something as simple as email notifications would help alleviate this problem. As photographers we are often traveling or on the go. As such, our phones are generally our first point of contact when it comes to handling business. I think Pixsy needs to be available on the go, with instant notifications of all new matches, and the possibility to submit cases directly from the phone. Along with a mobile app, I would love to see integration of some sort with apps like Instagram. 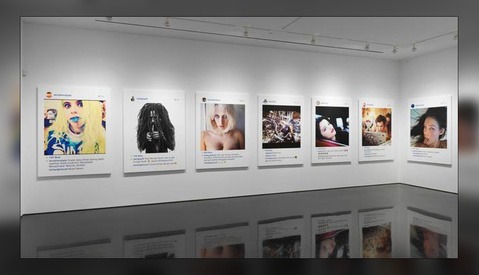 Apps like these are wildly popular and we have seen several instances where an image from Instagram is used in some sort of media coverage or promotional material. This is currently NOT possible through the beta, however the folks at Pixsy assured me that it is a feature which they will be including. I think it is a necessity and it is something that most certainly needs to be included. I wish Pixsy had a hover feature built in with helpful tips beside certain fields. 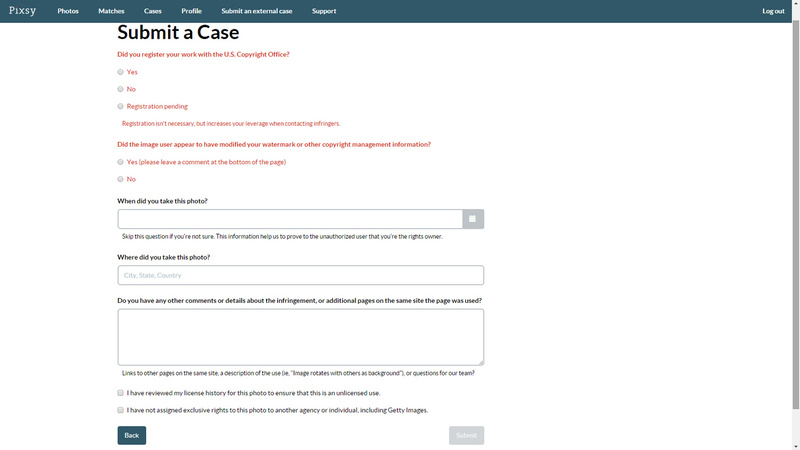 Although submitting a case is extremely simple, for someone less experienced, the wording may be a bit confusing. 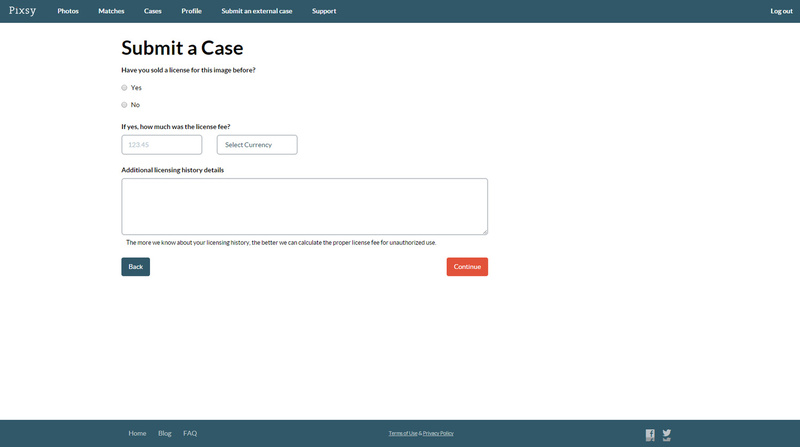 For users who have a lot of images that get stolen on a regular basis, it may be a useful addition to allow bulk takedown notices or bulk case submissions. Currently there is no feature like this, and images must be filed one by one. Pixsy is still in beta, and that means it isn’t quite fully finished. As such it is hard to make a final judgment call on a product that has yet to be refined. That said, we can quite clearly see the direction Pixsy is headed, and I think it is most certainly in the right direction. Though I think there are a few issues surrounding the ease of use of the service, it is without question that this is a necessary service. The improvements I have mentioned are minor inconveniences when one considers just how much the good outweighs the bad. Setting up an account is quick, and linking accounts is equally painless, however the fact that you need to be physically present at a computer to check the status of your images, and the fact you need to do everything through their website adds a few extra steps that some might deem cumbersome. For those who can’t be bothered to take the extra steps Pixsy may be a hard solution to adopt. Once you are on the site however, I find that using the service is incredibly intuitive and quite simple. It is a matter of uploading the images you want, and then waiting for the service to find matches. Once a match is found, you can then choose to ignore it, or to proceed with filing a case. The obvious point of interest is the cost. When I initially spoke of Pixsy there was no mention as to what the fee for successfully closing a case would be. All Pixsy said was that the fee was “nominal”. 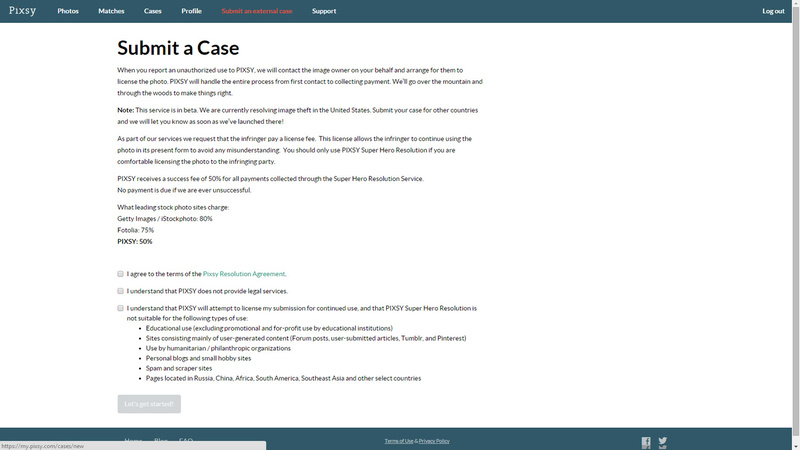 When one files a case through the Pixsy Beta, the cost of the service is displayed. The nominal fee Pixsy charges is 50%. Pixsy claims this to be a bargain when compared to comparable services provided by traditional agencies. A part of me feels as though many will scoff at the 50% fee, especially when it is presented as being “nominal”. Time will tell if photographers feel that this is a fair fee to pay for the convenience of a service which facilitates their fight against copyright infringement. Ultimately 50% of something, is better than 100% of nothing. Pixsy is being extremely tight lipped about their launch. They would not share with me any projected dates for launch. As much as I would love to share a timeline with you, Pixsy stressed the fact that they are in favor of a silent launch. Let’s hope not too silent because we need a strong voice in the fight against copyright infringement. Until further announcements you can request an invite from Pixsy on their website. They will keep you updated with the most current information via email. I wanted to thank you for this article! I've recently been invited to the beta, and I am incredibly impressed with Pixsy! Once a month, I used to dedicate a day solely to performing reverse image lookups via Google and TinEye, a process which took an entire day to go through my library of photographs. I was amazed how quickly Pixsy was able to find matches, and how many more matches it was able to find. I'll cry about the fact that there were over 13,000+ matches later, haha. I highly recommend this to any photographer, and am looking forward to their official launch!